The festival aims to raise funds for Children First Fund in support of orphanages in Phuket. Koh Mr Saxman and Pui Duaungpon will perform at 7pm, followed by Russian pianist and opera singer Ivan Sharapov at 8pm and then Black ’n’ Blue band closing the night. Tickets are B500 (seating with complimentary refreshment) and available at CentralFestival Phuket, Limelight Avenue Phuket and Phuket Indy Market in Phuket town and Laguna Tours Office in Canal Village. Online purchase is also available at www.lagunaphuket.com/foodandmusicfestival. Previously-purchased concert tickets for the same night (Saturday, 28 April at 8pm) can be used to enter the 7pm segment by Koh and Pui. 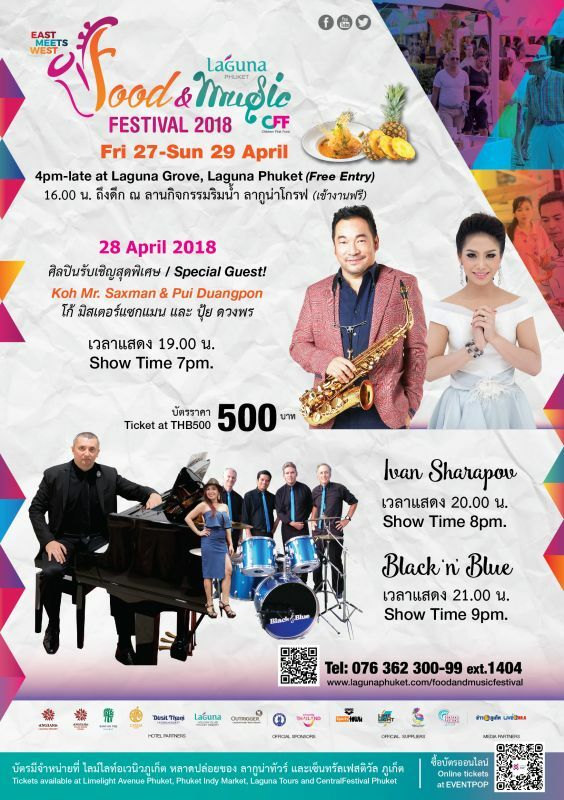 The concert is part of the three-day Laguna Phuket Food & Music Festival 2018, scheduled to take place April 27-29 at Laguna Grove, Laguna Phuket. The gate opens daily at 4pm to the free-entry festival, where guests and visitors can enjoy a wide range of food booths selling tantalising international and Peranakan cuisine. For more information, please visit the website (click here) or call +66 (0) 76 362300 ext. 1404 or email: ticket@lagunaphuket.com and follow Facebook/LagunaPhuketResort.